Roundup Ready varieties in Maturity Groups I and II were planted at the Aurora Research Farm in Cayuga Co., Neenan Brothers Farm at Lima in Livingston Co., and the Miner Institute at Chazy in Clinton Co. The Aurora and Lima sites, which are in central/western NY, average about 2450 growing degree days (GDD, 86-50o system) from May through September; whereas the Chazy site in Northern NY averages about 2150 GDD. 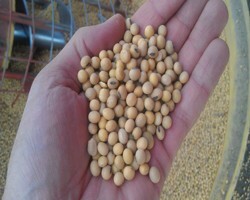 All seed companies that are known to be distributing soybeans in New York were invited to enter their selections in the tests for a modest fee. The seed companies chose either two or three sites to test their varieties. The April-May period was warm and dry in upstate NY, which allowed for timely planting at all sites. We planted Group I and Group II entries in separate tests at Aurora on 14 May, and Group I and Group II in separate tests at Lima on 24 May. At Chazy, Group I and II varieties were planted in the same test on 25 May. Each individual plot at all sites consisted of ten 20-ft. rows spaced 7 inches apart. Each entry was planted with small plot drill (6 foot wide Almaco) at seeding rates of 200,000 seeds/acre with four replications at each site. A randomized complete block experimental design was used for all tests. We used 22 fluid oz/acre of Roundup Touchdown about 5 weeks after planting for weed control at all sites. Aphid numbers and white mold incidence were low throughout the year at all sites. All varieties at all sites were monitored for phenological development beginning in late August and early September. Yields were determined by harvesting an 18-foot section of the seven center rows (4.08 feet) of each plot at all sites with a small plot combine (Hege 140C). Plant height and lodging scores (1.0-5.0 rating with 1.0=no lodging and 5.0=complete lodging) were taken at harvest. The Group I test was harvested at Aurora on 13 September and the Group II test on 25 September. The Group I and II tests were harvested at Lima on 4 October; whereas the Group I/II test was harvested at Chazy on 25 October. The Hege plot combine does not have weighing capability so the entire plot sample was taken to the lab to determine plot weight and then sub-sampled to determine moisture. All yields were adjusted to 13% moisture. We used the ANOVA test to determine significance for yield, seed moisture, lodging score, and height. All means were separated by Fisher's protected LSD (0.05) when significance occurred. May and June were warm months with ample rainfall (Table 1), which allowed soybeans to grow rapidly and fill-in quickly during the early vegetative period. Unfortunately, weather conditions turned exceedingly dry and warm from 20 June until 15 July at Aurora and Lima. The early Group I varieties at both sites attained the R3 stage by 15-20 July, which may have negatively impacted pod set in those varieties. Weather conditions were warm and moist until mid-August during pod and seed set for the late Group I and early Group II varieties at both sites. Weather conditions turned dry again, however, for the remainder of August, especially at the Aurora site, which coincided with seed-fill for the late Group II varieties. Consequently, the late Group II varieties generally did not yield as well as the early Group II varieties at both sites, probably because of more stress during the critical seed-fill period in late August for the Group II varieties at both sites. At the Chazy site, cooler temperatures and timely precipitation resulted in mostly stress-free conditions for soybeans in this northern location (Table 1). All Group I varieties attained the R7.0 stage (physiological maturity) by 1 September, and all Group II varieties attained the R7.0 stage by 7 September at Aurora. At Lima, the Group I varieties attained the R7.0 stage by 7 September and all Group II varieties by 15 September.